Rally is a dog sport based on obedience. It was originally devised by Charles L. "Bud" Kramer from the obedience practice of "doodling" - doing a variety of interesting warm up and freestyle exercises. 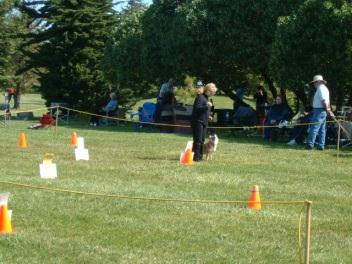 Unlike regular obedience, instead of waiting for the judge's orders, the competitors proceed around a course of designated stations with the dog in heel position. The course consists of 10 to 20 signs that instruct the team what to do. In contrast to traditional obedience, handlers are allowed to encourage their dogs during the course.